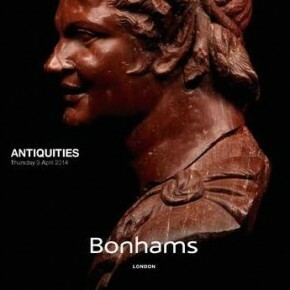 Bonham’s offers a stela owned by an Anonymous Swiss Collector, withdraws piece due to looting allegations. 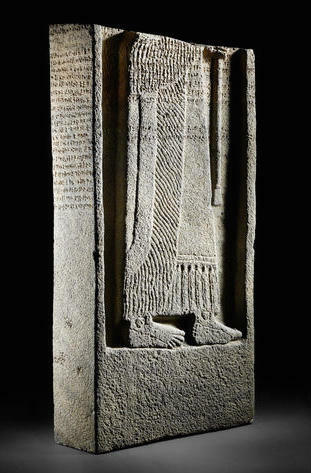 1) The British Museum owned the top half of the stela but would not buy the bottom half. 2) The bottom half of the stele contains what some are saying is a cuneiform curse directed at anyone who moves the sculpture. So clearly things that play well in the media. However the real story is much more complicated and seems to involve a case of looting and trafficking in 1999. I haven’t gone very far into this, but an Anonymous Swiss Collector is involved so I feel bound to give you all a run down. 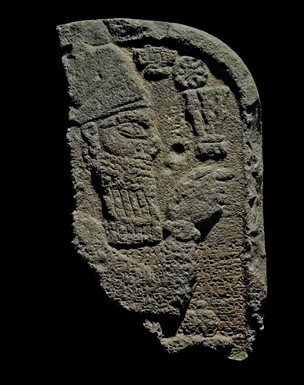 In 1879 the top half of the stela, which depicts Adad-nirari III who ruled Assyria from 811 to 783 BC, was discovered at Dur-Katlimmu, now Tell Sheikh Hamad, Syria. Locals brought it to the attention of archaeologist Hormuzd Rassam who found it had been hurled down a hill by folks who found it idolatrous. He suspected the bottom half was at the top of the hill somewhere. The top fragment isn’t in the best shape: It was clearly exposed at/for some time and, you know, was tossed down a hill. The stela top made its way to the UK where it entered the possession of antiquities dealer Joseph M Shemtob who sold it on to the British Museum in 1881. This is not an illicit antiquity. We know where it came from, when, and why. It is likely no contemporary laws were broken during its discovery, export, and import. …in the city of Arwad in the midst of the sea. I ascended Mount Lebanon. I cut strong logs of cedar. Whoever discards this image from the presence of Salmanu puts it into another place, whether he throws it into water or covers it with earth or brings and places it into a taboo house where it is inaccessible, may the god Salmanu, the great lord, overthrow his sovereignty; may his name and his seed disappear in the land; may he live in a contingent together with the slave women of his land. But where did this piece come from? Bonham’s lists the provenance of the stela as “Private collection, Geneva, Switzerland, given as a gift from father to son in the 1960s.” AHA! There he is again! The Anonymous Swiss Collector in all his ambiguous glory! A thoughtful gift from Anonymous Swiss Collector father to Anonymous Swiss Collector son, given before the 1970 UNESCO convention for sure and removed from Syria somewhere in the swirling mists of time before that. No record of anyone having seen it because, as we all know, beautiful works of art are best kept secret. The bottom half of this stela is an illicit antiquity. Tell Sheikh Hamad was excavated by archaeologists a few times, but none record discovering the stela bottom half or removing legally in any way. It was most likely looted and trafficked. Apparently Tell Sheikh Hamad was looted in September of 1999 and may have been looted since. Now is not a good time for Syrian archaeological sites. The 1999 date is important because our same Anonymous Swiss Collector first tried to unload the piece as Christie’s New York in 2000 but it failed to sell, possibly due to concerns about its illicit origins. The connection to the British Museum piece was made after this sale attempt but, you see, the British Museum can’t buy the bottom half even if it wanted to: it is not allowed to buy items of questionable provenance (anymore). Looks like the Anonymous Swiss Collector decided 14 years was enough laying low time and had another go at sale in a different auction house in a different city. 1) Why did a major auction house consign for sale such a dodgy piece in the first place? 2) What changed? What new evidence came to light about its origins and its Anonymous Swiss owner?